“I ate an entire box of fundips and now I have green paws.” – While home alone, Jackson, my blue heeler/lab mix gorged himself on a box of fundips left on the table. 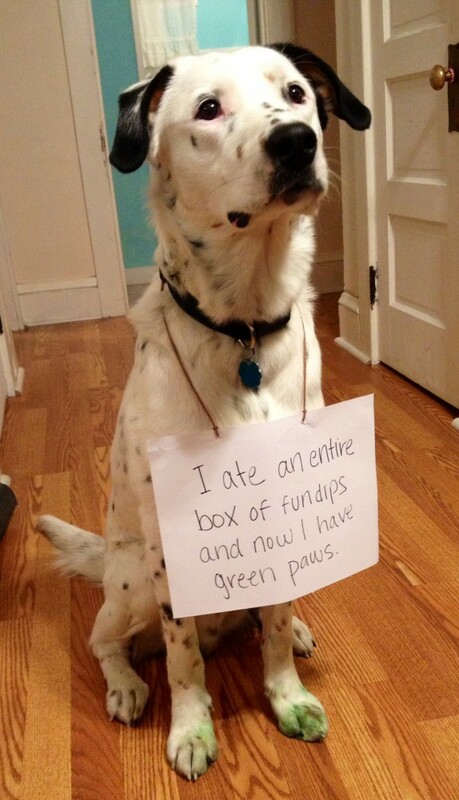 He would have gotten away with it if it weren’t for the sugar coating the entire living room and his mysteriously green paws. Posted May 20th, 2014 . He is ready to be Green Lantern’s sidekick! 1) Beautiful pup! 2) Sure there isn’t a little Dalmatian in there? 3) Sorry, but what are “fundips”? Fundips are some of my favorite candy. It is like Pixy Stix, but the sugar is in a pouch and you get a little candy scoop to dip into the sugar and then eat the scoop. My dog only likes the candy scoop doesn’t like the sugar. Fundips are the bomb…as Jackson knows! I don’t blame him. I would eat an entire box of Fundips, too!